thanks to B-DETECTION PLUS the online gas measurement system for your breath. 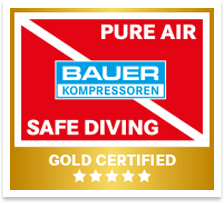 Pure breathing air is essential to protect your health and safeguard smooth functioning of materials! B-DETECTION PLUS ensure your air cylinders contain only air that complies with the strict specifications of the EN 12021: 2014 Breathing Air Standard. B-DETECTION PLUS is BAUER’s new-generation online gas measurement system. In 100% reliable and seamless operation, it monitors limit values of CO, CO2, O2 and – optionally – residual oil1 and moisture. 1 Residual oil measurement based only on volatile organic compounds (VOCs). Sensor calibration based on isobutene. The new B-DETECTION PLUS gas measurement system monitors the quality of the breathing air produced by your system in compliance with the Breathing Air Standard, DIN EN 12021:20141. Automatic, continuous and outstandingly reliable. When one or more limit values are exceeded, the compressor shuts down automatically. These safeguards ensure that breathing air cylinders are filled with nothing but pure, clean air at all times. All measurement values can be logged to provide you, as the operator, with solid legal certainty. To ensure complete safety, in cases where limit values are briefly exceeded B-DETECTION discharges contaminated air to the outside (optional), or shuts down the system if necessary. The new B-APP sends all current gas measurement data to your smartphone, enabling you to check the quality of breathing air going into your cylinders at all times. B-DETECTION can be tailored to your needs with a host of optional features including residual oil, moisture and ambient air measurement. 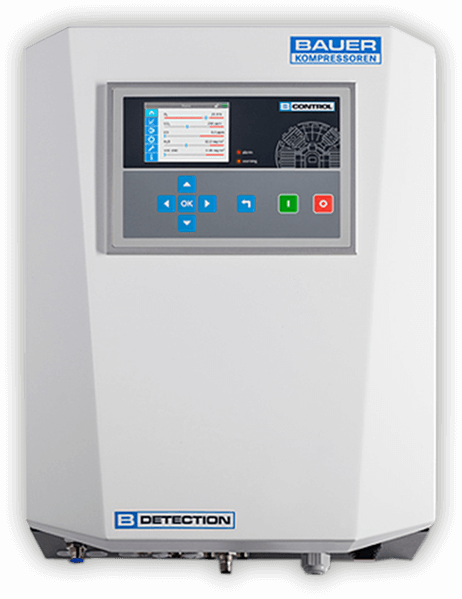 Watch this video to see how B-DETECTION works with your compressor to provide effective air monitoring! Visit our website for in-depth technical information about B-DETECTION PLUS.